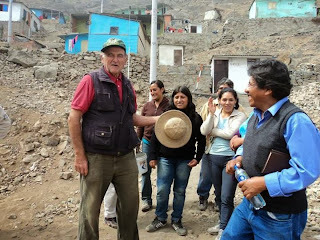 The spirit of the Vetiver System (VS) and those who use it, and of this particular conference, can be summed up in one man, Alois Kennerknecht (left in photo), of Lima Peru, who has single handed (using the little money that he had saved) motivated the poor of Lima to re-green the urban area that they live in with vetiver - the only plant that can survive the harsh conditions. Most of the participants are poor urban women who long for a brighter life. Women quickly take to vetiver, whether for improving and protecting their soil (Ethiopia and Kenya), or as a fibre source for handicrafts (Thailand, China, and Venezuela), or as community participants in vetiver initiatives in Mexico and Peru. Women too are taking a lead as bioengineers - Paula Pereira of Brazil, Yorleny Cruz of Costa Rica, Maria Calderon of Guatemala, Suwanna Pasiri of Thailand, Jane Wegesa of Kenya, Noah Manarang of the Philippines and many others. More than 100 people attended the conference that was held in Medellin, Colombia. The quality of presentations from countries in the region were excellent and indicated how much VS has expanded over the past 10 years. Paul and Nicholas Truong presented a new and tested model http://www.vetiver.org/LAICV2F/2%20Environmental%20Protection/E1Truong_TE.pdf for treating small scale waste water effluent. It has immediate use for treating coffee processing effluent in Colombia and other countries (Starbucks please note and support! ), as well as for treating household waste water and sewage throughout the tropical world. Coincidently Owen Lee (a Canadian) shared with us his design for a vetiver latrine in Haiti http://www.vetiver.org/LAICV2F/2%20Environmental%20Protection/E5Lee_TE.pdf. Bioengineering applications of vetiver were demonstrated in most countries in the region. Climate change and the associated severe rainfall events increasingly presents new challenges for slope stabilization; and vetiver is increasingly being used for stabilizing highways, building sites, and other man made earthen structures, and for rehabilitating the after effects of landslides (Joao Eboli of Brazil) http://www.vetiver.org/LAICV2F/1%20Bioengineering/B8Eboli_TP.pdf. Roley Noffke of South Africa and Rafael Luque of Venezuela showed how their companies are using vetiver for mining rehabilitation. It is interesting to see how in every case native plants naturally return to sites that use vetiver as a pioneer stabilizer. There were two interesting presentations from Guatemala and the Dominican Republic relating to the use of VS vetiver at large scale as a feedstock for steam/electricity generation. Most people who attended agreed that VS has a huge role to play in all Central and South American countries, in particular Brazil. There is no doubt that Vetiver applications perform well in Latin America if applied correctly, a critical need is expanding the application of the technology and getting more institutions, individuals and enterprises to use it. There are many hurdles - politics included. One thing is quite clear that the Vetiver System will create significant cost savings for governments and other users. There is abundant data showing vetiver "soft" engineering reduces costs by as much as 90% of "hard" engineering alternatives, and when used in association with "hard " technology vetiver more than often assures the survival of the "hard" structures and the overall success and integrity of the total investment. Even though vetiver hedgerows have been demonstrated to be highly effective in the region, VS is not used much by the agricultural sector, and greater focus needs to be given to this area in the light of continuing on-farm erosion and increasingly limited availability ofd crop water. The conference once again demonstrated the multi, cross sector use of VS from agriculture and infrastructure to bioremediation and health; and urban and rural applications. Vetiver grass and the Vetiver System is truly a unique that can do so much to improve the earth and those who live on it.